You are here: Home / featured / The Massive List of Homeschool Room Organization Hacks! Oh it can get messy in a hurry, can’t it?! Due to the fact that most homeschoolers just have a lot of stuff – curriculum, school supplies, books – it can be a challenge to organize those items in an efficient way. And if you’re short on space, the challenge becomes even more difficult. Browse through this massive list of homeschool room organization hacks to find fresh ideas for making your own homeschool space more efficient! Browse through 6 tools to help you organize your school room. See how this homeschool mom set up separate learning areas for her children: a geography corner, grocery store area, nature shelf, and more. Find out how this mom organizes lots of notebooks. If you have a lot of wall space, mount canisters on the wall to hold pencils, pens, and highlighters! Organize all of the homeschool curriculum that you aren’t currently using. See how this homeschool mom utilizes open and closed shelves in her school room. Love that map! Organize your homeschool using short-term and long-term storage solutions. Listen to this podcast to discover tips and tricks to organize your homeschool life. 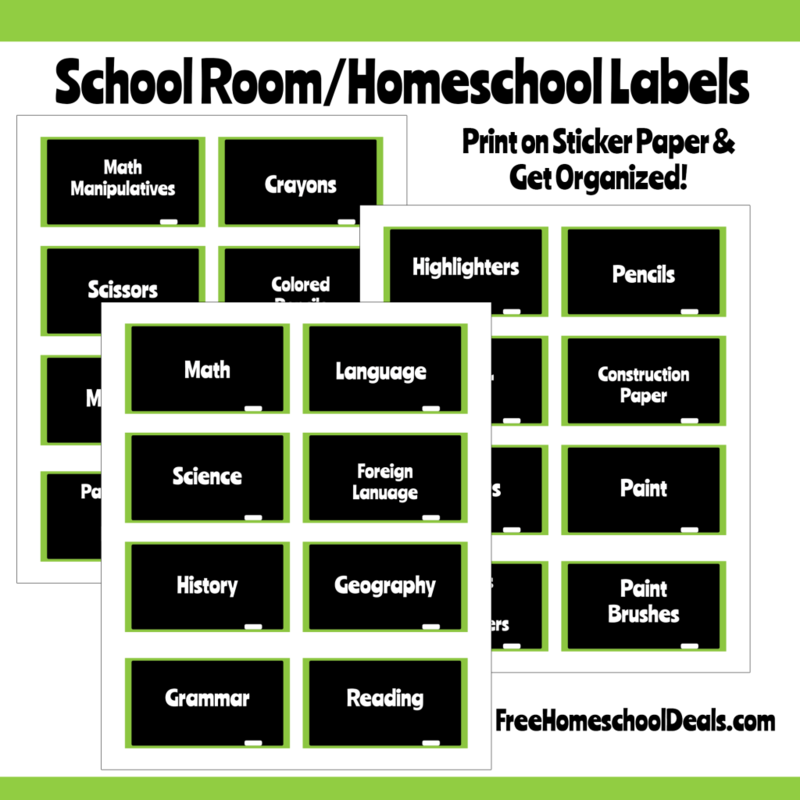 Make sure your children know where to put supplies with these homeschool room labels! Unsure of how to store oversized games or are clipboards MIA? 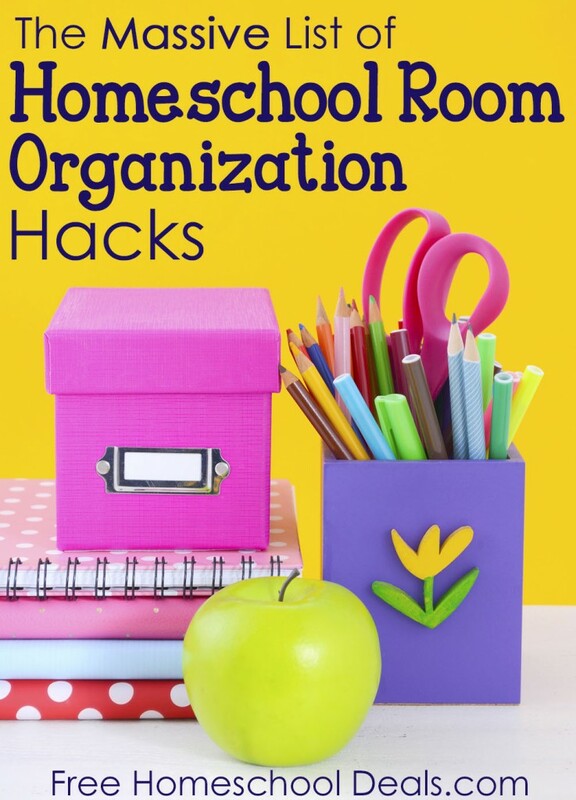 Read through 5 homeschool organization hacks to get your room on track. Use lockers to organize books and materials for each child. They’re functional and just plain cool! Consider organizing your homeschool subjects by color. Take a look at color coding each child’s homeschool supplies. If you do choose to color code your homeschool supplies, here are 12 odd items you can add to the list! Directions for a cute (and cheap!) art supply caddy. Here’s an idea to store all of the hands-on activities. See how this homeschool room is transformed using items from Ikea. Hint: It’s gorgeous and functional. Discover fresh, new homeschool room ideas, including unconventional and cost-you-nothing ideas. Make a homeschool station turntable to organize supplies. Read through 7 ingenious ways to organize your homeschool art and craft supplies. 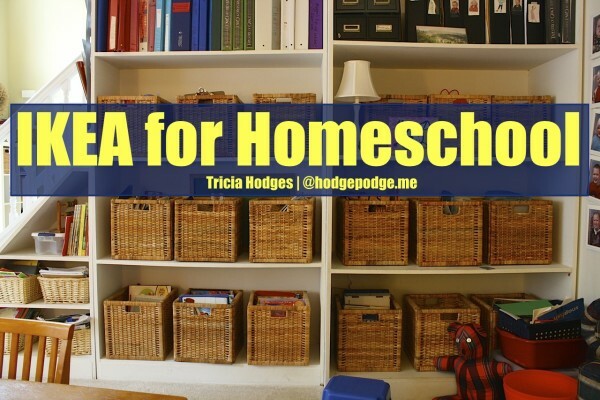 Use crates to organize homeschool supplies for each child. This is a perfect way to organize flash cards. No more torn cardboard boxes! Here are 3 ways to keep your homeschool organized in just an hour a day. Yes, Post-It Notes are my friend, too! This is a phenomenal step-by-step tutorial for getting a messy homeschool room under control! Use an over-the-door shoe organizer to get a handle on school supplies. Have only a closet to store your homeschool supplies? Find out how to make the best use of your space! Organize all of those small items – think paper clips and tacks – with mason jars. Store markers, pens, and pencils in this Marker Caddy you can make in 10 minutes. Organize math manipulatives in a tackle box! Browse through several ideas for homeschool organization when you’re educating a big family. 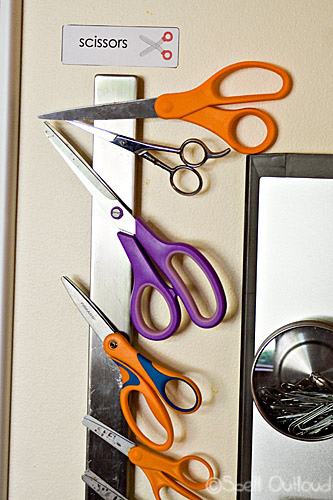 Everyone can access scissors easily with this neat storage trick! Have only a small space? These tips for organizing a small homeschool area are nothing short of magnificent. Browse through ideas to organize your space when you homeschool in a small area. And you can read through even more organizing tips when you homeschool in a tiny house. 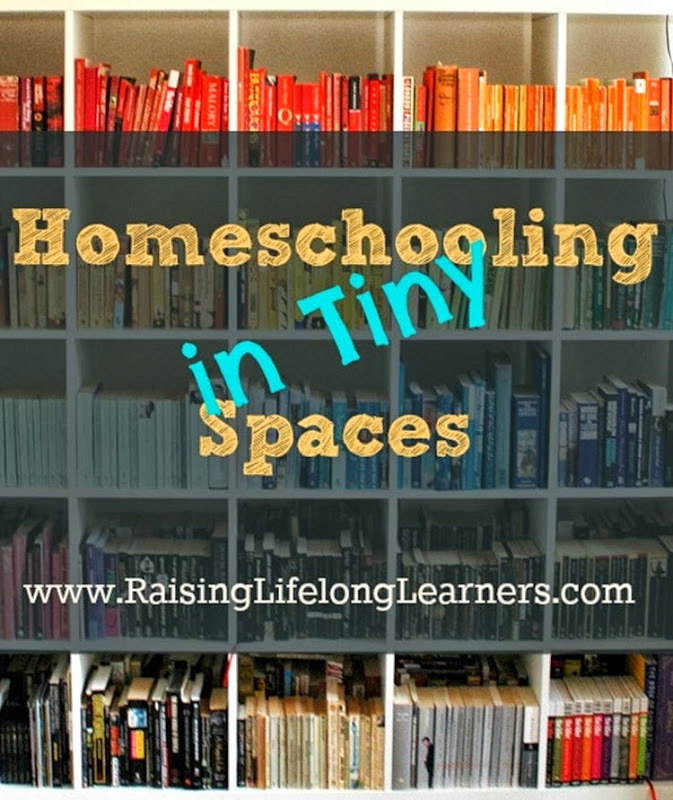 More creative ideas for homeschooling in a smaller space. One more for those of you in small spaces: Organizing your homeschool book shelf. If you’re short on space, use a crate that doubles as a chair. Make a set of DIY Seat Sacks for your kids’ chairs. Functional and pretty! Find out how you can organize all of the homeschool papers using a weekly filing system. This is a great idea for storing themed printable packets. Organize your homeschool area at the end of the year to cut down on clutter! Consider using file folders to organize papers for each child. Create a memory box to organize each child’s papers from year to year. This system really is the easiest way to keep track of your children’s papers. This mom has smart tips for keeping homeschool paperwork organized. Get homeschool papers organized with this simple folder method. Learn how to simplify and organize your homeschool bookshelves. See how this family uses Ikea Picture Ledges so books are readily available. Or use Ikea spice racks to organize books. Use metal basket shelving as a unique way to store books. Read through magnificent tips for organizing your homeschool library. Here are instructions for inexpensive DIY Bookshelf Ledges. Store your books for easy access in a mod podged book crate. What are your best homeschool room organization tips?